Redmond Real Salt is subtly sweet, has a wonderful flavor and is never bitter. It makes every bite of your food delicious. Redmond Real Salt is unrefined, unprocessed ancient sea salt. It has no additives and includes the trace minerals that are essential for your health. It is natural, just the way nature made it – nothing added or removed. Real Salt is recommended by doctors and health professionals for its unique blend of trace minerals. Redmond offers a variety of different packaging, sizing and grain size. This makes it suitable for different applications and usage. The convenient refill pouches and shakers are perfect for food storage and great for traveling. It can make a practical gift for an individual or family. Redmond Real Salt is mined in the United States. The mining facilities have been located in Utah since 1958 from an ancient seabed, which has been protected from modern pollution. This means that your salt will travel fewer miles to get to you compared to Himalayan, Celtic, Malaysian, Irish and Marine sea salts. It is better for the environment in that respect. PRO #1: This tastes like regular salt. The fine texture comes out of a shaker easily, unlike some sea salt brands. PRO #2: The price for Redmond Real Salt is very competitive. I don’t feel like I’m overpaying for a seasoning at all. PRO #3: It is all natural. I don’t have to worry about what iodine was added to this or what minerals got stripped away during the processing of this salt. CON #1: It is more expensive than conventional salt. You will have to pay a little more, but it is a much higher quality. CON #2: You can’t find it in every local grocery store. It is available in health food stores and on the internet. CON #3: This is not organic certified. Who is Redmond Real Salt for? Redmond Real Salt is great for the individual who wants to eat healthier. It is ideal for the person who want to add minerals to their diet naturally. Real Salt is great for people in the United States who want to focus on local products. Redmond Real Salt is mined in Utah, which means that it does not travel as far as Celtic sea salt or Himalayan sea salt. It also means that you are supporting an American company. 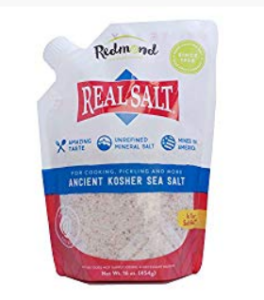 The cost of 16 ounces of Redmond Real Salt comes to $7.49 on their website, which is better than the $8.49 on Amazon. However, if you pay the shipping that they charge on their website, it becomes much more expensive. Shipping to the East Coast, where I live, came to $5.99. However, using the Amazon Prime feature enabled me to avoid the extra shipping charges. I love Redmond Real Salt. I find it less expensive than the Himalayan sea salt and Celtic sea salts on the market. I also appreciate the texture of it a bit more than Celtic sea salt as it comes out of the shaker without clumping together. I initially ordered Redmond Real Salt after I read about the water cure. The main premise of the water cure is that water and salt are essential for our health. The theory is that health conditions are due to chronic dehydration and a lack of the essential minerals that are found in sea salt. While the water cure didn’t cure all my ailments, I did feel better drinking more water and taking a bit of sea salt each day. The taste of Redmond Real Salt was great. I liked that the texture was just as fine as the iodized salt that I replaced it with. I didn’t mind the light pink color at all. It seasoned my food just like iodized salt, but I had the peace of mind that I was getting minerals that were stripped away in iodized salt. I also wasn’t worried about consuming too much iodine by salting my foods with this type of salt. VERDICT: LEGIT! I highly recommend Redmond Real Salt for individuals who are located in the United States. Buying locally produced foods is much more environmentally friendly. Easy Caprese Salad Recipe – My Favorite Keto Snack! I typically use Himalayan pink salt because of the minerals and the taste. I will have to try this Redmond real salt, especially since it is an American made product. I don’t think I have ever seen it in stores here on the east coast so thanks for pointing it out. I will have to buy some the next time I buy salt. I bought it from Amazon. 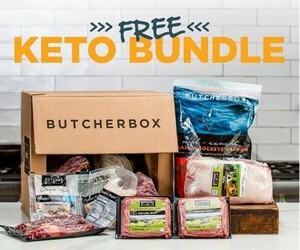 With Prime, you get free shipping. I think Whole Foods may carry it as well. Will try this one. Its also cheap. I like your review, it is very informative and insightful. I live in Ireland so I think I have access to a decent salt. However, it is refined one so I think your recommendation would be the better way to go. Thank you. All the best. If you are in Ireland, I’d look for a source that is local. Maybe Celtic sea salt. You’ll get all the same minerals. It is unrefined. Hiya, like Wendy I also use Himalayan Pink Salt for the added Minerals, I read The Water Cure and found it very interesting – maybe a link to the book would be useful for this page? Is there a big difference between Himalayan Pink Salt and this Redmond Real Salt? I am in the UK if that makes a difference. If you are in the UK, I would use Himalayan Pink Salt. There isn’t much difference. You don’t need to import sea salt. This is a great one for people in the United States because it is local. I have heard a lot about this kind of salt. I like that it is a lot better than regular table salt and can be easily shaken out of a salt shaker. Plus it’s made in America! I am sold!